Are you planning on attending the CIM Convention in Vancouver? Looking for some tips to get you #CIMReady? Don’t miss the opportunity to attend and learn new perspectives and solutions for your unique mining challenges. Come learn and share best practices, innovative insights, and make influential relationships from all walks and demographics of the mining industry. Still not convinced? Here are the top three reasons to join us this year at the CIM! Come see the latest mining technologies, products and services. 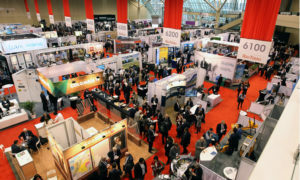 Visit exhibitors to learn about their offerings and how they can help you elevate your personal and business practices. Meet speakers like Sean Roosen, the founding member of Osisko Mining Corporation. Sean brings more than 30 years pf progressive experience to the mining industry. You’ll also have the opportunity to network with John Bianchini, the President and CEO of Hatch. John has worked extensively in process development and the evaluation of hydrometallurgical and chemical processes in the base metal industries and has implemented major metallurgical facilities for clients around the world. These are just a few of the speakers that will be attending CIM. Don’t miss your opportunity to stay ahead of the curve and start thinking differently! Mingle and grow your network. Connect with like-minded peers for collaboration and sharing best practices on modern approaches and insights on the future of mining. Stay safe and productive, get exposure on the latest products, like the award winning N-Connex modular networking solutions, Vertical Rise Stairs (VRS) adjustable multi-purpose platforms, Diphoterine® Solution by Prevor for chemical splashes, and much more! Learn what’s new in the industry and how you can implement these products and services into your workplace. Still haven’t registered? What are you waiting for?! Click here to get your ticket – and then come visit us at booth #426!